The addition of a shell was the definitive step in the transformation of a strung bow into a musical instrument. The first shells were taken directly from nature, a practice that continues even today (i.e. tortoise shells, pumpkins, etc.). A new shape, very successful, is created by the replacement of the bow system with the neck-headstock system, which remains in use even today. The art of lutherie was naturally not left untouched by the improvement of woodworking tools as well as the commonplace use of objects made of carved wood. Carved wood shells of various shapes and forms fully satisfied the aesthetic requirements of the first luthier, creating a variety of musical timbres, thus revealing the direct correlation between shell and sound. Only the nature of the material will impose restrictions on the application of this newly discovered principle. Large shells that could produce deeper timbres are essentially cumbersome, fragile, and demand plenty of effort and material. The same stumbling block was encountered centuries ago by naval architects while trying to enlarge the hulls of their first ships. The problem was overcome by replacing the one-piece hull with a keel made of several different pieces. The only difference between shipbuilding and lutherie lies in that in the case of musical instruments the internal moulding structure must be removed. The structural solution was encountered in much more commonplace object, the watermelon. The remains of the slices left after a refreshing watermelon feast, could be reconstructed back into an empty watermelon shell. It is interesting to note here that in the terminology of Greek lutherie, the shell is called ship, while the stave slice. This radically inventive solution had brought equally astounding results. Thin wooden strips brought together using a mould, were glued together giving a light, yet durable shell. The excessive use of material is avoided, and the new method requires more craftsmanship than elbow grease. The geometry of the new shell mould is quite simple. One halve face of the shell is revolved 180 degrees around the axis running the length of the musical instrument. The surface produced, using a group of coaxial planes that pass along the aforementioned axis (Fig.1) is divided into equal sectors (odd (Fig.2 )or even (Fig.3)).The intersection of the curved shell surface with the plane of the sectors gives us the edges of each stave. Another geometric model gives us an odd number of staves, plus two smaller half staves (i.e. each equal to one half of the others), which rest symmetrically at the two ends of the shell surface and conveniently are perpendicular to the face of the instrument. (Fig. 4 ) Additionally, a flat capping stave in the back secures all the staves into place. (Fig. 5 ) This second model prevailed due to two advantages: first, the central stave (in the case of a odd number of staves) rests in the middle of the shell, thus serving as a guide in its construction (the term for this stave among Greek luthiers is stave-mother ). Second, the fact that the two halve staves are perpendicular to the face of the instrument, greatly facilitates the construction of the rest of the instrument. We will mention some simple qualities of this geometric model, as they will highlight the points where new modified shells deviate from the original. The stretched out shape of each stave is a symmetric spindle, whose axis of symmetry passes along its two apexes. (Fig. 6 ) while that of the two half staves, is exactly half of it. In a perpendicular section of the shell, the maximum height is equal to half the total width. All the staves converge at the two ends of the shell. One by one these characteristics were altered, mostly for practical reasons, as the simpler the geometry, the more inflexible it proved to be. A minor “mistake” in the construction of the mould requires the staves to differ from each other in order to follow it. The loss of a millimeter from a stave necessitates that the one next to it be equally larger to compensate for it. Thus, the symmetry of the shell suffers, but at least the whole shell successfully converges at the required points. (Fig. 7 ) The apexes of a stave can be easily damaged, especially when the wood is knotted and delicate. The capping stave serves to cover such damaged ends. This case gave birth to the idea of an incomplete stave (whose stretched out shape is part of the complete spindle) (Fig. 8 ) a concept that greatly helps the luthier when he has to deal with particularly “flawed” moulds. Moreover, an incomplete central stave can accommodate a variety of “flaws”.(Fig. 9) Hence, the luthier feels free to gradually improvise with the mould. The number of incomplete staves increases and they are placed in every possible position (Fig. 10 ) conferring significant advantages to the instrument making process. The application of the aforementioned practices makes the shell much more versatile in shape, and consequently in terms of the timbre it can produce. 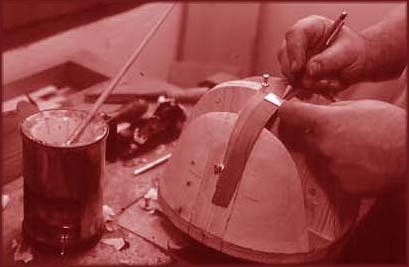 Additionally, the luthier can freely experiment with the aesthetic parameters of the instrument, adapting the shell to his own unique aesthetic. Lutherie becomes another form of sculpture, both structural and acoustic, as the shape of the shell directly influences the timbre of the instrument. The new geometry is definitely more versatile, but at the same time more complex (bordering on the realm of modern mathematical topology), inspiring new principles in instrument making. The luthier now can follow the geometry in an instinctive and intuitive manner, playing around with the shell like a juggler. He “cheats”, “twists”, “rapes” the stave. In the end, the mould must be covered. The Neapolitan luthiers devised a very elegant solution to solve the same problem of excessive strain due to the adoption of steel strings in the small Neapolitan mandolin. The two lateral incomplete staves meet the face of the instrument in an acute (instead of right) angle , while the face of the mandolin is “raked” into to two different planes. This sturdy yet light construction is finished off using two small thin lateral staves that run from the capping stave all the way to the neck. (Fig. 15) Such is the robustness of the instrument that the staves can be vaulted, or the wooden strips between them replaced by silver wire, without compromising the strength of the construction. This method of construction remains in use today, with only slight variations. The mandolin traveled to the U.S. and there interbred with another “immigrant” instrument giving birth to a dynamic new hybrid. So what does remain of the good old original stave shell? The answer is, a property that can never change. When the stretched out spindle (complete or incomplete) is curved to form a stave, its two edges turn into planar curves, allowing consecutive staves to fit perfectly (Fig. 16).This property formed the point of departure and cornerstone of my study, when fifteen years ago I started researching staves. The unavoidable question though is, is there any point in this study, apart from a historical curiosity? The answer arrives unforced, as a result of this study. The vast array of shells encountered above, exemplifies the huge sculptural potential of such a unique wooden construction, which allowed itself to be manipulated to such an extent to cover the requirements of luthiers and musicians through the ages. New research can lead to construct new shells, produce new timbres, and seek new solutions. Such is the aim of this study, to contribute to the understanding of the value of stave construction, beyond the traditional luthier approach. Just like any personal study, it cannot escape arbitrary conclusions, omissions, and dangerous hypotheses. Reality is too diverse to be studied by one person alone. This study could have been much more complete, were it not for my lack of access to or knowledge of international bibliography. Finally, I intentionally omitted historic and social issues, recognizing that they would only impoverish this study. Note: In this study the term “stave” which is derived from barrel construction, is preferred to the more commonly used terms “strip” and “rib”. I believe that both these terms are too general, and do not allude to any specific shape or structure.